Relax onboard Vasco da Gama and experience in a few days what many only dream of. Discover Broome, home to the world-famous Cable Beach. Spend two days in Bali enjoying the island’s spectacular beauty, relaxed lifestyle and cultural wonders. Immerse in Geraldton’s maritime history. 2 nights aboard the Indian Pacific travelling from Adelaide to Perth in Gold or Platinum Service. Your journey includes all meals, drinks and off train experiences in Cook and Rawlinna. 2 night stay in Perth at the Rendezvous Hotel Perth Central including breakfast. 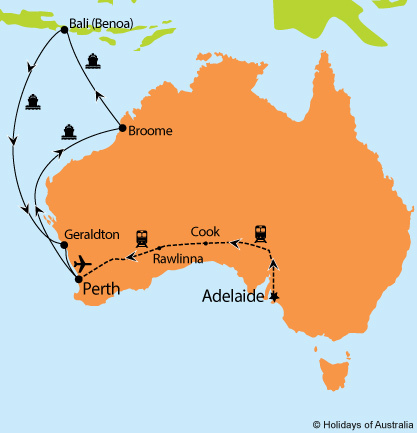 12 nights aboard Vasco da Gama cruising on a roundtrip from Fremantle with port calls in Broome, Bali (Benoa) & Geraldton. Your cruise includes on board meals & entertainment. Transfer from the cruise terminal to the airport. One way economy flight from Perth to Adelaide. † Transfers included within a 50km radius. Extra km’s additional. Images courtesy of Cruise & Maritime Voyages, Great Southern Rail, Tourism WA, Dennis Rochel.